There is a Symbiotic relationship between a Sycophant and a Stuffed Shirt. A Sycophant's role is to elevate the Stuffed Shirt to his superior expert role. Sycophants are an essential part of the process. A Stuffed Shirt cannot exist in his Supremacy without many underlings who function as cheerleaders, facilitators, networkers, conference attendees and book purchasers. Sycophants are expected to be advertisers of a Stuffed Shirt’s ideas, theologies, projects and brand name. Sycophants pay to do this. It helps fund the Stuffed Shirt’s life calling, including his Halftime retirement plan. Note that much of the subject matter in this post is covered in a multitude of previous Herescope posts spanning 2005 to the present -- posts which have exhaustive documentation on these topics. and between the lean cattle. The widow’s mite (Luke 21:1-4). It is one of the most durable myths in Evangelicaldom. Leaders perpetuate the myth with their endless fundraising. “Your dollar will help my project to ... fill in the blank.” These leaders say they are doing “the Lord’s work” and every mite you send to them will “bless you” in return. But is Evangelicaldom fueled by widows’ mites alone? No! The whole Mega-Ministry Empire operates like a giant Cash Cow, and its Reigning Monarchs act like Fat Cats. 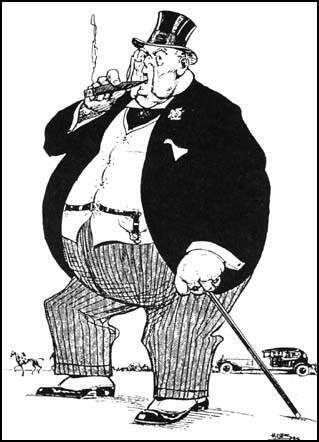 Since most Fat Cats are treated like Sacred Cows, their people rarely question them about money matters. But where does all their money come from? Surely not just from tiny widows’ mites! “Seed-faith” giving was re-branded as “Faith-Promise” giving in the 1970s by the new army of dark-suited Church Growth Consultant Fat Cats, who used persuasive and subtle techniques to finance the rise of denominational-less Community Centers – a new breed of Cash Cow Mega-Churches. Meanwhile, the Prosperity Teacher Fat Cats issued prophecies about a “great outpouring of wealth,” and promised if you followed their teachings you’d get rich. “I must be doing something wrong,” a friend complained. “I keep giving them money but I am not getting wealthy. What is wrong with me?” She didn't ask what was wrong with the Fat Cat, nor question what might be wrong with his teaching. The well-oiled Evangelical Cash Cow Machine operates on Fat Cat Big Money but it reaches into your pockets incessantly, too. Hang on to your wallets! Everything costs money! Cash Cows thrive on the money derived from conferences, book sales, DVDs, promos and special events. The gospel isn’t free anymore. The Gospel of Salvation is still free – you can read it online here: http://www.blueletterbible.org. But the other gospels that Fat Cats manufacture? – these cost money. You have to buy their books, curricula, training, workshops or programs. You have to invest in their exclusive formulas and innovative strategies for church or personal growth. Presumably these investments will reap benefits for you. Benefits like status, significance, stardom, influence, self-esteem, profits and promotions. That’s the thinking. Most Cash Cows cultivate their Image. Money talks, people listen. The Elites have it. Chances are, you don’t. It is only human nature (unredeemed) to want to associate with, emulate, imitate, and esteem those with lavish lifestyles and lucrative endeavors. But understand this – these Fat Cats want YOU to finance THEM! They are busy building an empire and it is your job to be the cannon fodder. Well, okay, maybe it is not that bad, but note that it is YOU who are expendable. YOUR money, your time, your talents…. all part of THEIR plan. Question: Is your money going to the Lord Jesus Christ? Or to a Fat Cat who is building a Cash Cow Empire? The Modern Monks of Status and Significance flaunt the latest fashion, and do all their “emerging” through chic urban artistic and cultural pursuits – all of which comes at huge price. Can you afford it? Just try to emulate it! Richard Foster wrote The Freedom of Simplicity, but the actual cost in real-life to go plain and simple was sky-high. I know; I tried it. Leadership Mucky-Mucks travel the globe while espousing sustainable lifestyles, and sacrificial missional tithing. YOU are the one who must become sustainable and sacrificial, not the Fat Cats. These practitioners are men and women who are leading transformation churches, directing companies that are uprooting corruption and eradicating systemic poverty, and in so doing they are seeing the Kingdom of God bring down the Gates of Hades. They will be available to connect with you, sit down for a meal, answer questions, exchange insights, and by the end of the week when you go back home, nothing will be the same. Do you fancy yourself an up-and-coming Leader? Were you raised in the self-esteem generation? Register for a hip leadership conference where “Everyone is a Winner” – after you cough up the $319 registration fee. The road to becoming a Fat Cat is paved with gold. Your gold. Last week, a key Billion Soul Network investor chose to give $155 toward each new membership for the next 50 Global Church Learning Center Memberships! We now only have 34 Memberships left! He has chosen to do this so that the price can remain at $195 instead of the regular price of $350 per year. That's right! If you or someone on your team chooses to become a GCLC member right away he/she will receive a $155 discount for joining. All of these will be gone soon! The reader may wish to start calculating the added costs of travel, airfare, fancy hotels, workbooks and meals to attend all of these Cash Cow events. For example, you are cordially invited to have “Christmas Dinner with Chuck and Nancy [Missler] on Saturday, Dec. 15, 2012 at their new home, The River Lodge, Reporoa, New Zealand. Only $55.00 per person. Limited to 50 people!” This type of exclusive offer obviously only applies to those who are already well on the road to Prosperity. Fat Cat Wannabes and their Big Donor cousins enjoy this type of special attention. Facilitating unity and collaboration amongst Christian leaders to address today's urban issues. Accelerate your efforts to develop a “culture of generosity” in your church through a series of highly specialized, interactive gatherings, enhanced by relationships with fellow pace-setting churches. Outcomes include an increase in financial stewardship and generosity among church members, increased funding through donor support, and funding for mission initiatives. The new official statistic is that there are more than 5,000 multisite churches in North America. That’s more than 5,000 different churches, each of which has two or more different geographic campuses – one church in two or more locations. Cash Cows and Fat Cats finance the 7 Mountain Mandate to build the Kingdom of God on Earth. This comes in as many guises as there are many streams of Dominionism. Craig Hill, who runs the Family Mountain in cahoots with Os Hillman (who runs the http://www.reclaim7mountains.com website), has published a new book Five Wealth Secrets 96% of Us Don’t Know. The aptly named Hill says the problem is that “96% of us have never been taught to practice the Five Secrets that result in natural, supernatural, and generational wealth multiplication.” Mountain Building requires Monetary Multiplication. In fact, some Fat Cats have very creative Cash Cow operations that collaborate with downline marketing and other money-making schemes. See Quantum Collaborator David Van Koevering's website http://www.davidvankoevering.com/groundingsystems.htm for an intriguing example. TheElijahList even advertised Hyssop Health Therapy in conjuction with Van Koevering's teachings on Quantum Physics (8/07/12). 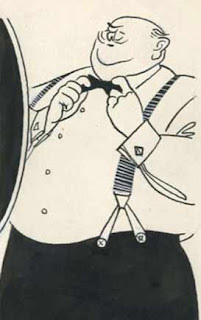 Despite the public fund-raising hooplas, it is a myth that Brother Fat Cat’s Mega-Ministry depends on widows’ mites – small, humble contributions. In fact, it is much more sophisticated than this. Fat Cats get money from other Fat Cats. It is how the game is played. Where does all the money come from to finance the Evangelicaldom Empire – the big media moguls, the large advocacy groups, the huge mission endeavors, the megalithic parachurch movements? The money most likely comes from a host of foundations, philanthropic entities, other non-profits, and complex financial organizations that offer sophisticated “giving” strategies. Some demand accountability and attainment of outcomes. Others target specific causes and agendas that may be political, cultural or... even spiritual. But this is just the tip of the iceberg…. The Koch Brothers, “whose annual revenues are estimated to be a hundred billion dollars,” funds the political Right in America, which is intertwined with the Evangelical Right. Chick-Fil-A, which came into controversy for funding anti-gay marriage activists as part of its multi-million dollar giving. Just so you aren’t buffaloed, be aware that the Cash Cow entities that finance the Evangelical Universe aren’t always in the foreground. These creatures pasture in the back forty where they can flourish sight unseen. They often act in herds, making operations they support, and breaking those that they dislike. And many recipients cloak their financial Fat Cat sources. No wonder so many church groups now utilize elaborate screening devices to handpick elders for their board of directors! And this point doesn't even begin to consider the interlocking boards of directorates of Evangelicaldom's massive and diverse Parachurch Empire. This is the tip of a gigantic iceberg. This list could go on and on. Follow the money trail if you want to find out who actually controls the agendas of the organizations you see in Evangelicaldom. Prophets for profit are proliferating, and millions are buying into spiritualities that are cheating them out of their eternal life savings. 6. Email from Dr. Robert Watkins of Kings & Priests Unlimited, 8/20/12, advertising www.ConquerAtlanta.com scheduled for Nov. 15-16, where you can “join Robert Watkins, T.D. Jakes, Dale Bronner, Luther Ragsdale, Evelyn Watkins, Bruce Cook, Johnny Enlow and other seasoned business experts.” You can even earn 20% from referring others this event by going to this link and signing up. 8. “Catalyst Conference/Atlanta/Oct. 3-5/Register Today” e-mail sent out by Todd Rhoades 8/21/12. Too late! You missed the opportunity to have rubbed shoulders with Andy Stanley, Francis Chan, Craig Groeschel and other Sacred Cows! 9. http://ocsummits.com/business/. Check out the other speakers. 13. http://movementday.com/ and start looking at all of the webpage information. These quotes came from: http://movementday.com/671785.ihtml. Note that “Halftime” is a project of Leadership Network. See also: http://movementday.com/496194.ihtml, http://movementday.com/648802.ihtml, http://movementday.com/686610.ihtml, http://movementday.com/501045.ihtml, http://movementday.com/686501.ihtml, http://movementday.com/686555.ihtml, http://movementday.com/647805.ihtml, http://movementday.com/671787.ihtml. Also see: http://nycleadershipblog.com/ and note that Keller has launched a New City Catechism to go with this movement http://www.desiringgod.org/blog/posts/the-new-city-catechism-a-remarkable-coming-together . Designed to address the increasing need to build a culture of generosity in churches throughout Europe, Leadership Network is partnering with Stewardship (UK), Crown Europe, Christians Against Poverty (CAP), and the Lausanne Committee, to facilitate the European Generous Churches Leadership Community.” See: http://leadnet.org/page/generous_churches1 Note that your church must have “an average weekly attendance of at least 500 members” to qualify. 21. See articles such as, “Chick-Fil-A Re-Evaluated Funding for Anti-Gay Marriage Groups – ABC News,” http://abcnews.go.com/m/blogEntry?id=1727253022. Read Part 1: Sacred Cows & Stars. How did this tabloidesque culture of the Stars emerge so easily in evangelicaldom? These Superior Superstars owe it all to training the Superstitious Sheep. Fawning Followers, captivated, bow down at their platforms. Time and again the malleable sheep will follow ostentatious or pretentious Shepherds, no matter how far off the narrow way they journey. Fallen Shepherd? Hey! An occasion for even more publicity! The “Touch not God’s anointed” mantra guarantees that meek sheep won’t question the deceptive path. The Revered Stars are above questioning. They are Sacred Cows, after all. Spiritual starvation tactics work well. Hungry sheep will follow Snakes into the pit, hoping a bit of the Charm of their Stardom will rub off. “Benny Hinn laid hands on me!” my friend exclaimed in awe, after he followed Hinn around the country seeking a cure for his cancer. Clever magician tricks on a spectacular stage entranced him into believing that Hinn – not Jesus – would meet his needs. “But the crowds!” he explained when pressed. “They stretched around the building for blocks!” That made it right. If plenty of sheep/fans follow the leader, then Stardom must be okay. Meek sheep don’t dare question the popular fads of rising Stars unless they want to get a terrible backlash. Some churches will show them to the door. Bread and Circus – the ancient Roman means of keeping the crowds controlled by superficial entertainment and fleshly delights. The Hallowed MegaStars have fully equipped entourages. They hold huge stadium events with phenomenal lighting, hypnotic loud music and an immense presence enhanced by sophisticated stage mechanics. The effect is awesome. Pizzazz. And it is all peer-driven. Sheep follow the sheep, too. Who would want to be associated with the humble Gospel message in a tiny church with cold wooden pews? Why bother with Pastor Nobody in Nowheresville? The popular hip crowd is going BIG. Follow the crowd! Hang out with Big-name leaders in Big-domed stadiums with giant screens, colored lights, throbbing drumbeats, intoxicating messages. And while the fans are whipped up into frenzy, the new doctrines are introduced. Slick. Subtle. Serpent-like. The new gospel is M & M – Missional and Misanthropic. It is all about the Leaders, don’t you know?! Compassion? It is manufactured, too. Ignore the “least of these” unless the Superstar can profit from the act of associating with them to appear humbly “missional.” Stand for a photo op with a poor person in Africa – it works! Everyone falls for it time and again! But Stardom is not really about substance. It is all about supercharged numbers, rabid followers, riotous pop culture, lots of moolah and being edgy. How do you deal with an elder board that is out of control? You've got a cocky and arrogant staff member. Or a guy or gal who is incompetent or untrustworthy. Maybe you hired a real jerk. Making staff changes in the church is really tough... in fact "freeing someone's future" is one of the hardest, yet most needed things we need to do…. You’re in over your head, and the options are not pretty. You’re overstaffed. You’re under budget. And your people are smelling it. The local newspaper just wrote an article about your church that is disparaging, or worse yet, totally untrue. Or a disgruntled church member has started a blog about you and your church…. How should you deal with a PR nightmare? These topics include things like pastoral obesity, muslim relations, security issues in the church, cohabitating seniors, and truth-stretching. Speaking of “truth-stretching,” Sacred Cows specialize in it. Their version of the gospel is about Kingdom and Culture, not Christ and the Cross. These Divine Denizens have now reached far beyond the Local Church. They need an expanded arena of operations. First they set up branch churches in other locales. Not church planting – but babies still on the umbilical cord of the mother church via upline tithing and sterile pre-canned teaching. Profitable indeed! Next, these Pied Piper Pastors play a new tune. They must wield power over more than just their church-based sheep. It’s easy! Simply redefine “Sheep” to mean "Culture." Big Bad Culture, after all, needs changing and conquering. It must become Sacred so a Star can reign over it – especially via sophisticated community transformation methodologies. Stars have Utopian dreams. Sheep are the slave laborers. Certain Superstars are now advocating opening up their flock to universal salvation – a clever trick that especially increases their numbers and popularity. Thus making it all the easier to fuse Church with the Culture. The two shall become one. No more nasty separation. A large pedestal must be built for any Superstar who achieves this death-defying feat! Sacred Leaders are a temperamental puffed up lot, you know. They require faint-hearted Sheeple to think more highly of them, preferring them. They believe that the humble should not be exalted, especially if it threatens their own popularity. And any sheep with discernment should be treated as “offscouring.” They invoke one spirit, but believe only the Elite have many gifts. “Let all men glory in Leaders” is their slogan, contrary to I Cor. 3:21. Puffed-up Priests, all of them. And the sad fact is, despite all of this, the sheep continue their faddish worship of these Sacred Cows and Stars. For even hereunto were ye called: because Christ also suffered for us, leaving us an example, that ye should follow His steps: Who did no sin, neither was guile found in His mouth: Who, when He was reviled, reviled not again; when He suffered, He threatened not; but committed Himself to Him that judgeth righteously: Who His own self bare our sins in His own body on the tree, that we, being dead to sins, should live unto righteousness: by Whose stripes ye were healed. For ye were as sheep going astray; but are now returned unto the Shepherd and Bishop of your souls. 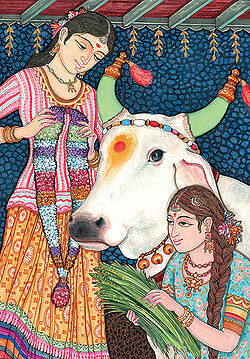 1. http://en.wikipedia.org/wiki/Cattle_in_religion The image of the sacred cow is from this webpage. 2. Matthew Poole, A Commentary on the Holy Bible, Vol. III (Hendrickson), p. 794, commenting on 2 Timothy 2:16-17.